If you regularly read my beauty reviews, by now you should probably know that I really like the body balm and body milk by Uriage Eau Thermale. It’s nice to find out that the brand sticks to the same delicate style and feeling in their new products as well. 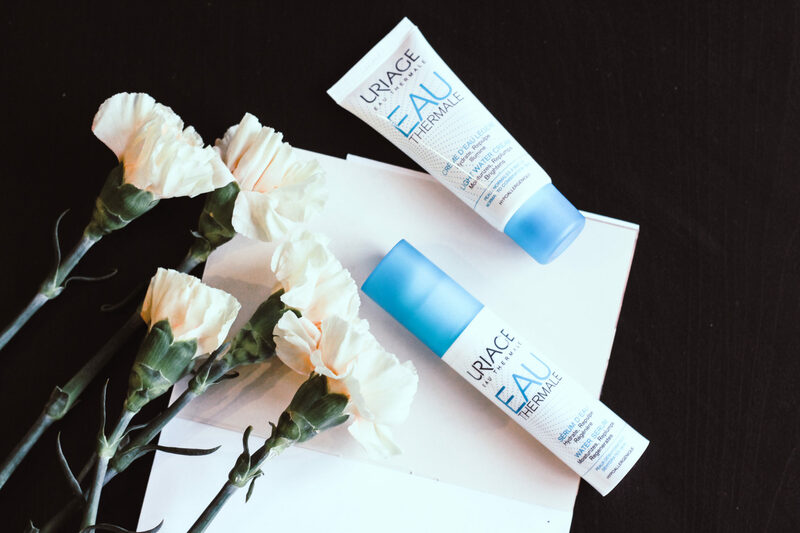 We recently received the new facial care by Uriage, called Eau Thermale and decided to give it a good test and share with you guys our thughts on the cream and serum. Overall, the products from this range contain pure thermal water and are hypoallergenic, the scent is of fresh citrus and peachy fruits. Sounds nice, right? Keep reading to find out more about each of the products! The Light Water Cream is a real moisturizing treat to the skin. The cream has a soft, almost watery texture, which is suitable for normal to combined skin types. My skin is a bit oily and I can honestly say that this product is not greasy, doesn’t leave a heavy layer and actually soaks up pretty fast. The scent is super fresh and delicate but as my skin is not irritated by perfumed products I cannot really say if it might have such an effect on too sensitive skins. Anyways, the product is said to keep the skin balanced throughout the day and comes in a richer version too, which is more suitable for dry skin. I haven’t tried out this version but I think it would be a good alternative for colder days, especially during the winter. Has anyone of you tried it? If so, please share your experience as I’m thinking whether I should try it out. The Water Serum contains active ingredients that hydrate the skin deeply. It’s recommended for dull, dehydrated skin as it replenishes it and restores the natural levels of moisture. Therefore, if you have dry spots and areas on your face and neck or your skin type is generally dry and lacking natural moisture, then this serum is for you! The hyaluronic acid and a hydrothermal complex are what “wakes up” the skin, making it brighter and moisturized. As for the texture, it’s similar to the Water Cream from the range since it’s very watery and soaks up almost immediately. That’s why, I think this product is suitable for all skin types that need deep hydration. After all, hydration is the foundation of the beautiful, healthy skin, right? Overall, I really like the products of this range and think that they offer very careful care for every skin type and all ages. Of course, it depends on what exactly you’re looking for in your skin care but generally you should always aim at maintaining healthy levels of hydration. That way your skin tone will be bright, even and its texture will be plumper and will appear younger. You can always combine the hydrating serum from the range, followed by your regular anti-age cream, for instance! Let us know in the comments below what is your regular beauty ritual and how you maintain your skin hydrated and happy!